The time finally comes when the plunger no longer works despite the herculean efforts you put. We have all been there, and if you haven’t, it might be sooner rather than later. Often, we end up paying plumbers a small fortune to clear the clogs or spend a ton of money on a plumbers snake when we can avoid the expensive services by purchasing a drain cleaner. Clogs of any kind are a nuisance, and having a drain cleaner is the best line of defense. The question though is which is the best drain cleaner? To avoid the back and forth purchasing products that rarely work, we have created a guide for the best drain cleaners. Topping our list as the best option is the Comstar Pure Lye which is a natural drain cleaner. It is powerful to clear roots, clogged drains, greased traps, and septic systems. This product is a strong base and will react with fats and grease to create a soapy solution that drains effortlessly. One fascinating aspect of this drain cleaner bead shape. This aspect allows the Pure Lye to sink to the bottom and attack the clog. It works best with a slow-moving drain and not a fully-blocked drain. Moreover, it is ideal for all piping other than aluminum, and you can safely use it in a garbage disposal. Ensure you have removed any blockage and let it sit in the unit for 20 minutes before running water. Though the Comstar Pure Lye drain cleaner is safer and easier to use, we recommend you wear safety glasses and disposable glove to avoid contact. Also, ensure you run warm water first before pouring the Lye down your pipes. Follow this with warm water, and at this time you will hear the Lye fizzing. Ensure you use it only on slow-moving drains, and that windows are ever open in case of fumes though this unit is odorless and doesn’t produce fumes. Our best features though were that this cleaner is septic safe and it is safe. 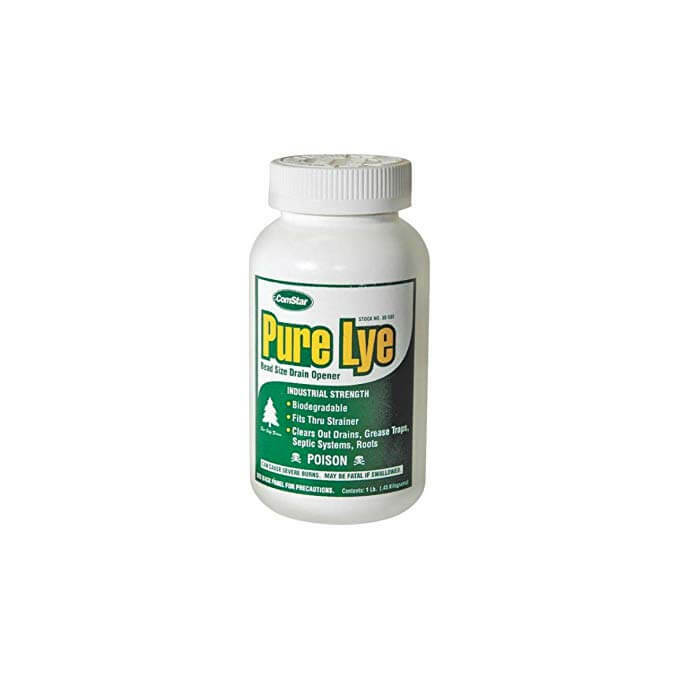 Septic tank safe – Pure lye is a naturally occurring substance, and we recommend it if you use septic tanks as it will not harm the bacteria nor will it damage your tank. Pure – The Comstar pure lye is 100% pure and can be used for more than drain cleaning. You can use it for cold process soap making or baking. Seeing as this is pure sodium hydroxide, we recommend it for use in hospitals and homes where safety is paramount. Be it the kitchen drain, the laundry room, or the basement; this bleach formula will blast through the clogs in a jiffy. What’s fascinating is how easy it is to use. Pour the solution into any slow-moving drain and wait for 15, or 30 minutes for tough clogs. Take the necessary precautions and ensure it doesn’t spill on you or splash on any surface. Once you have let it sit for no more than 30 minutes, we can flush, but we recommend you pour warm water down the pipes. Nevertheless, what piqued our interest in this item is how it cuts through water, and safety. 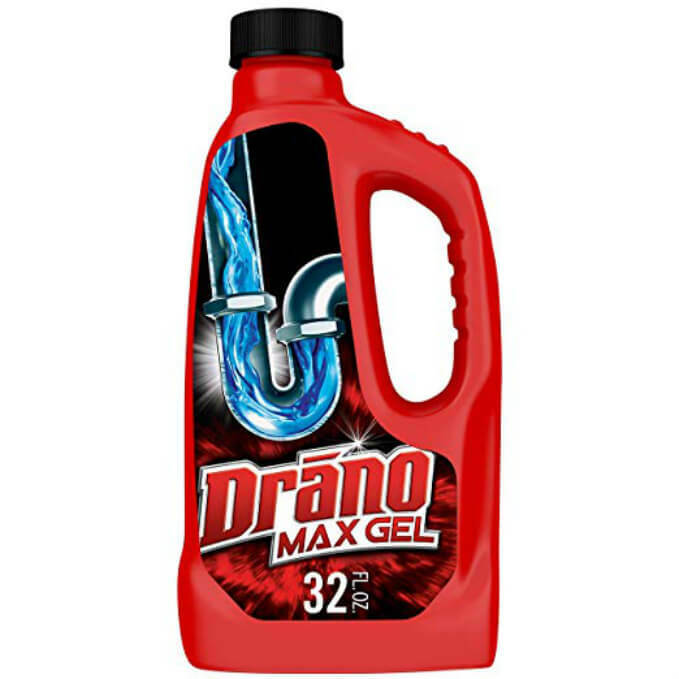 Dense – The Drano Max Gel is thick and is designed to cut through water to get to the blockage. As such it is best for a fully blocked drain as it will sink and cling to your clogs blasting them. Safe – if you are concerned about your pipes, we recommend you get a bottle of this as it is designed to protect pipes from corrosion. You can use it for PVC and metal pipes, and it is septic safe. We recommend the Drano Max Gel for homeowners dealing with difficult clogs and especially hair clogs. 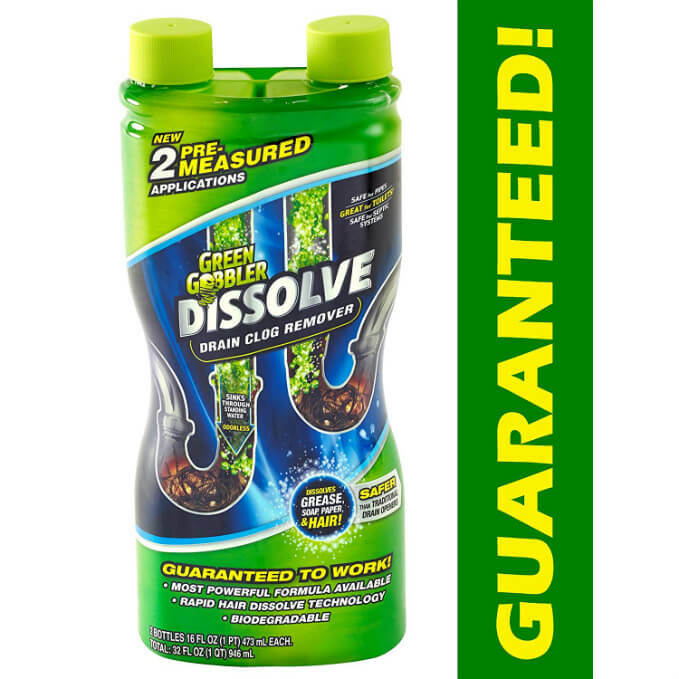 If you are in the market for an eco-friendly option and one that works with any of your pipes, we recommend you get the Dissolve by Green Gobbler. Green Gobbler doesn’t specify what is in the bottle, but they insist that they follow Green Chemistry as stipulated by the Environmental Protection Agency (EPA) and thus they are the ideal if we are to conserve our rivers and marine life. This item is also perfect for sinks, showers, and especially toilets. Our best features though are that there is no measuring required and no mess to create, and it dissolves clogs quickly. Rapid dissolve technology – We also recommend the Dissolve owing to its speed and effectiveness at clearing clogs. It works in minutes and dissolves clogs or hair upon contact. We recommend the Green Gobbler dissolve for the environmentally conscious individuals and homeowners who always have to deal with toilet clogs. It only works with hot water as only hot water can activate the crystals. Therefore, ensure you have warmed up some water before pouring the crystals in the drain. Start by heating the drain to prepare it and then add the crystals followed by warm water. The formula will dissolve hair and any other clogs in less than 60 seconds. Moreover, you will appreciate that this product is made in the U.S.A. With so many manufacturing jobs leaving the country, it is a nice touch to see some still operating and offering employment to Americans. Our best features though were that it’s odorless and works well with septic systems. Odorless – Thanks to its non-acid formula, the Thrift Drain Cleaner is odorless making it a favorite for homes and hospitals. Septic Safe – For people using septic systems, you will appreciate that this drain cleaner is septic friendly. It contains sodium hydroxide which is affable to bacteria, and it is non-corrosive maintaining your septic tank. We recommend this product for hospitals and other areas where an odorless drain cleaner is required. If you are looking for an environmentally-friendly option, we recommend you get the Bio-Clean. This product is designed to protect the environment, humans, and your plumbing. In nature plant and animal matter is broken down by bacteria and enzymes and recycled into plant food. The Bio-clean uses the same principle. It works only on organic matter such as food particles, hair, and grease, and thus you need a different cleaner to clear inorganic clogs. One fascinating aspect of this cleaner is that it has four enzymes unlike the two found in liquid cleaners. The four enzymes work on four types of waste (protein, carbohydrates, grease, and fibers) found in drains. Moreover, it retails in powder form to retain the potency and is not affected by gravity. That is, once the bacteria find their way to the clogs, they will eat their way and spread to every part of the drain. Moreover, this product is economical since a 2-pound container can clean a 1,000-gallon septic tank, or be used for 100 drain treatments. Our top features though were the safety and how septic-friendly it is. Safe – The Bio-Clean produces no fumes, creates no heat, and doesn’t boil. As such it is safe for use in households with young kids and can be used for all drains. Restoring bacteria action in septic tanks – The Bio-Clean uses natural bacteria to clean your pipes, and these bacteria inadvertently end up in your septic tank repairing damage from chemicals, bleaches, food preservatives, bowl cleaners, etc. 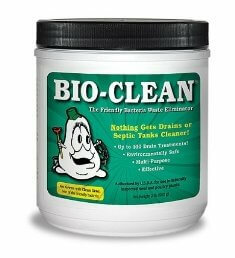 We recommend the Bio-Clean for regular drain maintenance and for people whose clogs is from waste build-up. Also, it is best for people looking to restore bacteria action in their septic tanks. 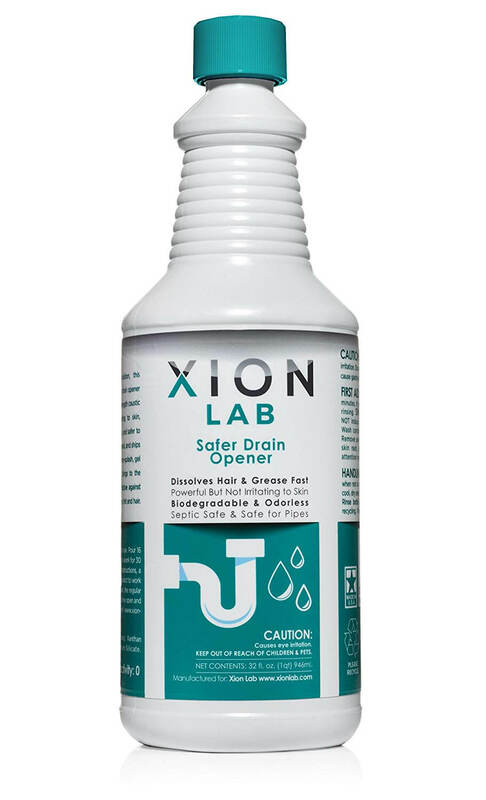 An easy to use drain cleaner, we recommend the Safer Drain Opener by Xion lab for people with wholly blocked drains. The Safer drain cleaner is a dense liquid drain cleaner and is designed to sink to the root of the problem. It works quickly generating heat and as to clear the clogs. For a slow-moving drain, you can expect this product to work in about 30 minutes but leave it overnight for extremely stubborn drains. 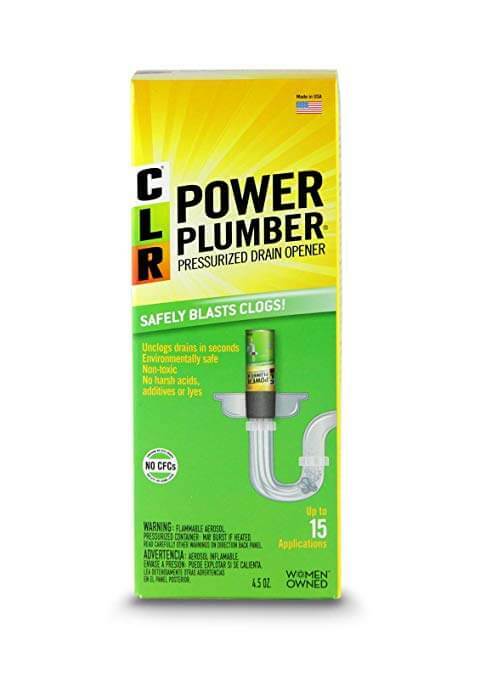 Another fascinating aspect of this product is that it is recyclable, and you can use it in all pipes. It is easy to use and odorless for home and hospital purposes. We recommend you use it regularly if you have a history of obstructions. Our best features though were the perfect balance and that it is biodegradable. Biodegradable – There are more than enough harmful chemicals in the environment as it is, and we should strive not to add more. The Safer product is manufactured with the environment in mind as it is biodegradable. Perfect Balance – Most homeowners are looking for options that are extremely powerful but safe to use, and these are rare. On the one hand, you have acidic cleaners that work in minutes if not seconds, but are quite dangerous, while on the other you have enzymatic cleaners that are safe but take too long to clear a clog. The Safer drain opener is a perfect compromise, as it is safer than acidic cleaners but works faster than enzymatic products. Great for people dealing with stubborn clogs but are also concerned about their safety. The Scotch Corporation drain opener is one we would recommend for people with stubborn or tougher clogs. It is also best where safety is paramount as it is non-acidic and thus a safe product to use. First, we appreciate that it is made in the U.S.A which is a noble undertaking seeing as many manufacturing jobs have left the country. Moreover, you can expect a higher quality product as the company has more control over the quality. Using this cleaner is also a breeze as it only entails pouring ½ the bottle or two cups down the drain and waiting for an hour. Overnight is better. However, you will have to use more than one bottle if the clog is further down in the drain. Our best features about this product are that it is septic safe, and its performance. 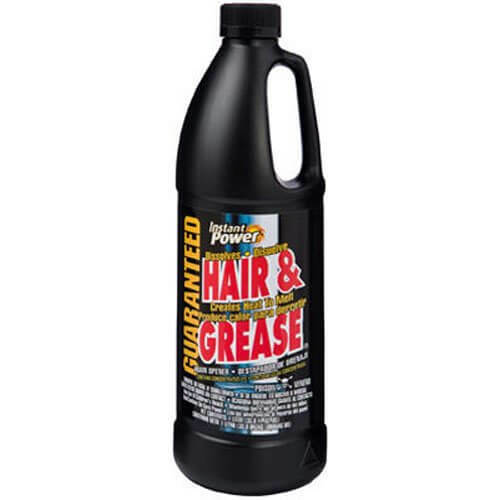 Performance – The Hair and Grease cleaner is perfect for bathtubs, showers, and sinks. First, it dissolves the hair clearing the blockage, and it produces heat to melt grease in the drain. Septic Safe – The chemicals in this product are sodium hydroxide and potassium hydroxide. Both are fast-acting but are friendly not only to your pipes but also to your septic tank as they don’t harm the bacteria and enzymes responsible for breaking down waste. This product is designed to clear clogs owing to hair and grease, and should only serve that purpose. 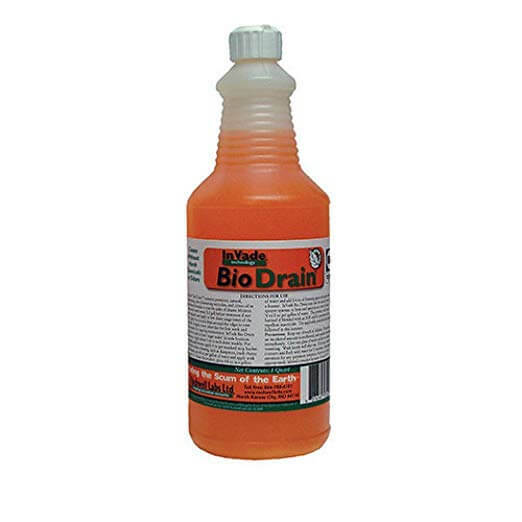 If you are tired of the pesky flies around your drain, we recommend you get the Invade Bio Drain. However, the flies aren’t the problem, and the organic matter built-up inside your drain is. Flies are attracted to this gunk and use it as a breeding ground. As such, you have to get rid of the waste to get rid of the flies. This product also works to clear drains and is quite effectual. The Invade Bio Drain consists of natural microbes, a gelling agent, and an emulsifier blended to create a thick consistency. This mixture sticks to the walls of your drain and immediately begins working on the waste or blockage. Moreover, seeing as these are natural microbes, it is septic friendly, and safe to use. Our best features though were how economical it is, and the fact that it is odorless. Odorless – One component included in the Invade Bio Drain is citrus oil. It helps eliminate the odor from the gunk; it makes the product great for urinals as it has a sweet scent. Economical – You can expect a 1-quart bottle to last you for eight applications as you only need 4 oz. for the first application. You can follow this up with 1 oz. weekly application per drain. Moreover, one gallon will last for 32 applications. Components: an emulsifier, citrus oil, natural microbes, and a gelling agent. Best for homeowners who want to get rid of gunk build-up and drain flies. Prevention is better than cure, and there is no better way to prevent clogged drains than to use the Rid-X commercial septic liquid at least once a month. This product cannot be used to unclog drains, but it has some components that are handy at preventing build up. First, the product contains amylase which is responsible for breaking down starch in your pipes, protease which breaks down proteins, lipase to break down any fats, oil, and grease, and cellulose which breaks down tissue paper and vegetable matter. 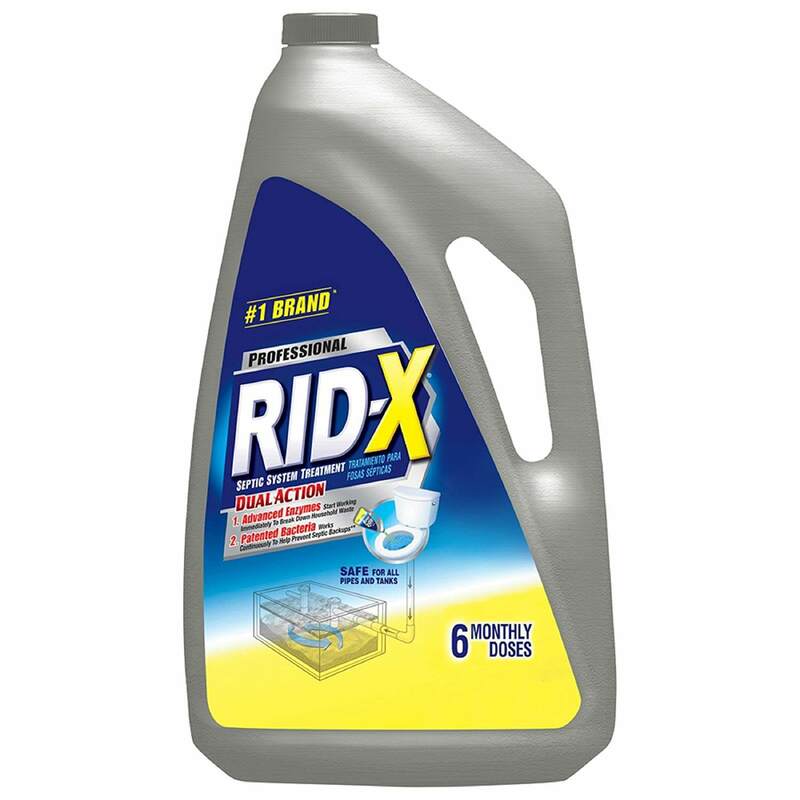 Economical – One container of Rid-X will sustain you for six months with monthly application. This is far better than most drain openers that can only be used twice. Bacteria restoration – After years of pouring bleach, food preservatives and other harmful products down the drain, the bacteria, and enzymes responsible for breaking down waste your septic tank are affected and not useful. By using the Rid-X septic liquid, you restore enzymes and prevent septic back up. 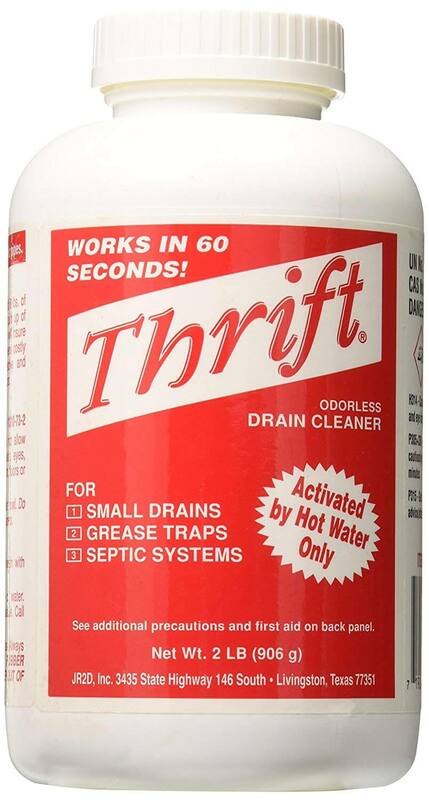 We recommend this product for maintaining drains and not unclogging them. Most of the drain openers on this list are designed to clear organic blockages. Inorganic blockages, on the other hand, are difficult to deal with as they are not easily dissolved. Often, you have to rent a plumber's snake or spend a small fortune hiring a professional. However, the CLR PP4-5 is designed to clear these blockages. The PP4-5 is a revolutionary aerosol cleaner formulated for use in sinks, tubs, toilets and shower stalls. It uses the water in your pipes as a ram to push the blockage down the drain, and it can reach 50 feet into the sewer. However, our best features were how eco-friendly and economical it is. Economical – When investing in a product, you want to get top value for your money, and the PP4-5 delivers. Each can has a limit of 15 applications which is way better than most drain cleaners that you can only use twice. Safe and Eco-friendly – In a house with young kids, we recommend the PP4-5 as it is safe. It doesn’t contain any harmful acid or lye that could harm you, your kids, or your pets. Moreover, it is quite friendly to your pipes, and the environment. It can be used for any plumbing, and you don’t have to worry about the enzymes and bacteria in your septic tank. Clears clogs 50 feet down the drain. We recommend the CLR PP4-5 for inorganic blockages and for people who are on a tight budget. Getting the right cleaner for your home can be quite confusing given the many brands on the market. This guide will help you make an informed decision and thus you can get top value for your money. First, determine why you need it. Often, it boils down to either clean your clogged drain or to prevent clogging. If it’s the latter, e., to avoid backed up pipes, we recommend you use a mild drain cleaner, but if you are in the market for a product that will clear out clogs, we recommend a more potent cleaner. There are three types of drain cleaners, and each has its pros and shortcomings. Caustic cleaners are basic and contain ingredients such as lye and caustic potash. They create an exothermic reaction when mix with water and are best for greasy clogs as they transform it into a soapy substance that drains quickly. Moreover, they are best for deeply embedded clogs as they are heavier than water. Oxidizing cleaners, on the other hand, use nitrates, bleach, and peroxides to oxidize the clogs. They make the obstruction lose its electrons breaking down the organic material. Finally, there are acidic drain cleaners which are only sold to professionals as they contain a high concentration of sulfuric and hydrochloric acids. It’s also crucial to take into account the reason for the clog as cleaners are designed to handle different materials. If hair is the cause, we recommend a cleaner together with a strainer that enables you to grab the hair, and a drain brush that allows you to drag the hair out. Also, you can opt for an acidic solution or a solid-basic solution if your drains aren’t metallic. Ensure that the product is in the pipes before running the water. However, you will need a chemical that can fragment food if you are dealing with a food clog. The latter is especially prevalent in kitchen drains. Finally, toilet clogs are often a result of an obstruction brought about by flushing items the toilet drain couldn’t handle, say napkins or sanitary pads. We recommend you use acidic cleaners but only in instances where flushing has become slow. Otherwise, hire a plumber if it is completely blocked. The safety of your family should be a top concern when buying a drain cleaner. Some of these products are harmful. We recommend you purchase organic drain cleaners as they are safe to use around kids. Moreover, you should consider the effects they will have on your drains. First, some of these products use strong caustic chemicals to handle tough clogs caused by grease or hair. However, they have a shortcoming in that they will damage any steel, aluminum or copper pipes. Also, these products create an exothermic reaction when they dissolve in water, and they might melt any plastic piping. Consider the cost of the cleaner before you purchase. Though you get what you pay for, buying an expensive cleaner doesn’t mean it will work. There are instances where you will be buying the brand and paying for marketing. Furthermore, investing in a low-cost unit doesn’t intimate that it will not work. Look at previous customer reviews for a feel of what the cleaner can do. In conclusion, avoid acidic drain cleaners if your house is connected to a septic tank. The chemicals kill the enzymes and bacteria that break up waste, and they can damage the tank. How can I predict my drain is clogged? Often, you can’t tell when your drain is blocked or blocking. By the time you spot a slow-moving drain, it is often too late, and it leads to mayhems. It is recommended you get a professional to inspect your drains (especially the main pipe) semi-annually. Moreover, use a preventive drain cleaner at least once a month to clear any build up in your pipes. How can I prevent clogs? Before we get into how to prevent clogs, first we should be able to identify the primary causes. Most bathroom drain clogs are a result of dirt and hair binding to soap scum on the drains of the pipes. To prevent this, we recommend you use a hair strainer drain cover to trap hair before it gets into your pipes. As for kitchen sink clogs, they are a result of grease buildup from cleaning greasy dishes and overusing the garbage disposal. The slight film builds up over time and is difficult to use. We recommend you reduce the use of your disposal to once a day, and wipe grease off your utensils before cleaning them. Furthermore, pour hot water down your drain regularly to prevent this build up. Can I make drain cleaners at home? Yes, you can, but they work for smaller clogs and results aren’t guaranteed. However, you can try them before buying a drain opener. Baking soda and vinegar – These are ingredients in most homes, or they are easy to acquire. Pour ¼ of baking soda down your clogged drain, and follow it with ½ a cup of vinegar. Baking soda, cream of tartar, and salt – We recommend this method as the results are splendid. Mix ¼ a cup of the above ingredients and pour into your drains. Pour about a liter of hot water and rinse with some cold water. Drain cleaners might not be enough to handle all the clogs and especially main drain clogs, but they are inexpensive compared to getting a snake or hiring a professional. The guide above can help you break a tie between two great products or to get the right drain opener. Finally, be sure to let us know if there is anything we missed in the comments below.